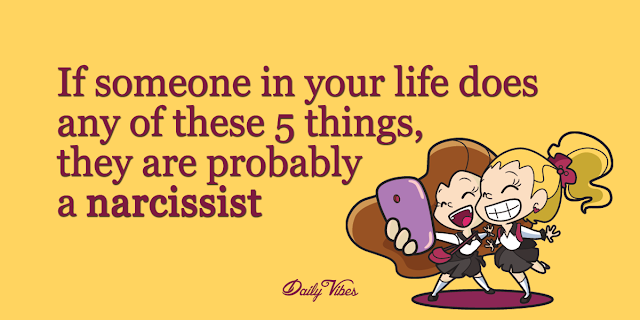 If Someone In Your Life Does Any Of These 5 Things, They Are Probably A Narcissist. By definition, a narcissist is someone who is overly self-involved, vain and selfish. They can also be cocky, manipulative and demanding. Narcissism exists in degrees along a continuum. It ranges from extra-healthy ego to pathological grandiosity. So, how do you know where on this spectrum someone in your life falls? 1. They need to be the center of attention. sript> This is not just a desire to be the center of attention, it’s a basic need for them. If the person in your life dominates the conversation, exaggerates their accomplishments, and only wants to talk about themselves all of the time, you are definitely dealing with a narcissist. A narcissist uses others without consideration or sensitivity. They will borrow items or money without returning or re-paying the debt. They repeatedly break promises and ignores their obligations. Narcissists show little or no remorse, but instead blames the victim. 3. They’re charismatic and persuasive. Narcissists can be very charismatic and persuasive. When they’re interested in you, they make you feel very special and wanted. But, it’s only for their own gratification. Once they lose interest in you (most likely after they’ve gotten what they want, or became bored), they may drop you without a second thought. A narcissist can be very engaging and sociable so long as you’re fulfilling what she/he desires. A narcissist will use his or her romantic partner, child, friend, or colleague to meet unreasonable, self-serving needs, fulfill unrealized dreams, or cover up self-perceived inadequacies and flaws. They will manipulate by using guilt or coerce you into making unreasonable sacrifices for them. Narcissists enjoy spreading and arousing negative emotions to gain attention, feel powerful, and keep you insecure and off-balance. They are easily upset at any real or perceived slights or inattentiveness. They may throw a tantrum if you disagree with their views or don’t live up to their expectations. They are extremely sensitive to criticism and will respond with a heated argument or cold detachment. Narcissists are often quick to judge, criticize, ridicule, and blame you. Some narcissists are emotionally abusive. By making you feel inferior, they boost their own ego to make them feel better about themselves.